(UN Photo / Amanda Voisard)President Jacob Zuma of South Africa addresses the general debate of the United Nations General Assembly's 70th session on Sept. 28, 2015. GENEVA - The World Council of Churches has welcomed a South African government initiative for a resolution on "Ethical Imperatives for a Nuclear-weapons-free World" for adoption at the Untied Nations General Assembly in New York. "We are greatly encouraged that this initiative is being taken at the UN General Assembly," said the WCC General Secretary Olav Fykse Tveit on Oct. 28. "We see the urgent need for creating strong support to translate its ethical imperatives into concrete and conclusive action," said Tveit, a Norwegian Lutheran in a statement. The WCC head noted that the resolution proposed by South Africa meshes with long-standing calls from the World Council of Churches and other world religious bodies to eliminate nuclear weapons. The council said it has repeatedly reaffirmed the Christian responsibility to safeguard God's creation and protect human life from such weapons of mass destruction. "The ecumenical goal of eliminating nuclear weapons is an expression of our commitment to a pilgrimage of justice and peace", said Tveit. South Africa's proposed resolution would declare nuclear weapons to be "inherently immoral". "It is unacceptable and unjustifiable that more than one billion people in the African continent are still excluded as permanent members of the key decision making structure of the United Nations, the Security Council," said President Jacob Zuma speaking at the U.N. General Assembly on Sept. 28. Zuma said, "There can be no safe hands for nuclear weapons. The humanitarian consequences of a possible detonation of a nuclear weapon, whether intentionally or accidentally, will be catastrophic for humanity. "We welcome the recent agreement reach on the Iranian nuclear programme and the recognition of the right of Iran to peaceful use of nuclear energy." 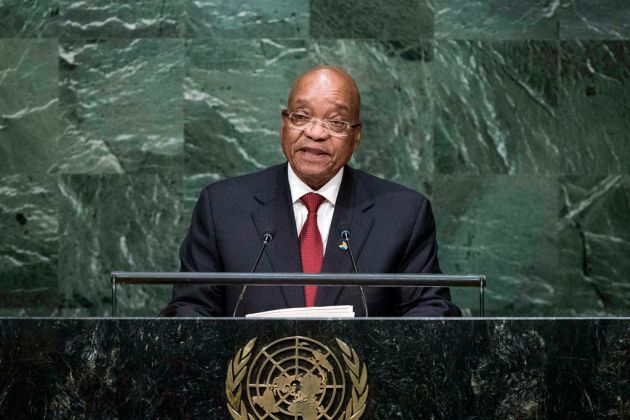 "A continent with a smaller population than Africa is represented by three countries on the UN Security Council," said the South Africa president addressing the 70th General Debate. In stressing the ethical responsibility of states and the need for broad cooperation, this South African-sponsored resolution is seen adding to the momentum of the "Humanitarian Pledge" to prohibit nuclear weapons, already supported by a majority of States, said the WCC. The pledge, initially proposed by Austria, offers nations a platform from which they can launch negotiations for a treaty banning nuclear weapons. "This draft resolution clearly names the profound ethical and material dilemma which must be faced by each government that has, or relies on, nuclear weapons," noted Peter Prove, who heads the WCC's Commission of the Churches on International Affairs. He said, "The South African initiative addresses a tough but solvable global problem with an ethical approach which all people of faith and goodwill will appreciate and understand. We call on all members of the international community to support it."